Herb jellies can be made from any combination of your favorite herbs. 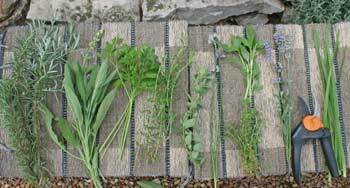 At the end of the summer season most people who grow herbs have lots of extra herbs. There are all kinds of ways to preserve them for winter. Most herbs dry well. Many, like basil, parsley and cilantro, freeze well (chop up in a food processor with a little bit of cooking oil and freeze in ice cube trays; or, just put sprigs of the herbs in plastic bags, push out the excess air and freeze). But herb jellies are also a great way to preserve summer flavors for those cold winter mornings ahead. Here's a basic jelly recipe that can be used for most any herb. Wash half-pint jelly jars in the dishwasher, or sterilize in boiling water. Keep jars hot until ready to fill with jelly. Use new Ball or Kerr canning lids, and keep them in hot water. Coarsely chop your chosen herbs and put in a medium saucepan. Add 2 cups of water or juice and bring to a constant boil for about 10 seconds. Remove from heat and let stand until completely cooled. Strain, discarding herbs, so that you have 1 1/2 cups of the liquid. Pour the herbal infusion (liquid) into a large cooking pot and add lemon juice or vinegar and the sugar. Bring to a hard boil, then add the liquid pectin and continue to boil for exactly one minute. Remove from heat and skim off any foam and discard it. Pour the hot jelly immediately into hot, half-pint jelly jars, filling them to within 1/2 inch of the top. Wipe the rims of the jars with a damp cloth and screw on the hot lids, just lightly tightening. Tip the covered jars upside down for about a minute to coat the inside and create a seal. Place right side up on a towel and let cool. Label and store in a cool, dark place. Your jelly will keep for 1-2 years. You can use fresh or dried herbs for jelly making. If using dry, use twice as much as when using fresh. 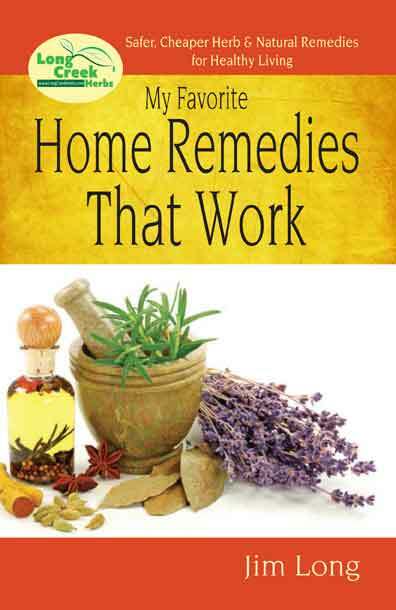 Herbs that work well in the above jelly recipe include: basils, such as cinnamon, Thai, spicy, etc. ; chives, chamomile, beebalm, ginger, lavender, fennel, lemon thyme, lemon verbena, marjoram, mint, parsley, scented geraniums, tarragon and rose. Combine herbs you would use in cooking, such as thyme, rosemary and sage, to use for Thanksgiving. Use orange juice instead of fresh lemon juice with orange thyme or scented geranium. Try white baslamic vinegar with tarragon to use on holiday rolls or breads. Use dried rose petals and scented geraniums together. Try basil and blackberry juice with a bit of lemon juice for a jelly. The combinations are endless. Here's a good lavender jelly recipe that's quick and easy. If you make thumbprint cookies, use lavender jelly in the middle for a surprising burst of flavor. Use this between layers of cake. Spread on toast, use it in frosting mix for cupcakes. Try a teaspoon or two in your afternoon tea. Tie up lavender flowers in double thickness of cheesecloth, securing with string. Combine pectin and apple juice in a saucepan and stir to dissolve the pectin. Bring to a boil stirring constantly. Add lemon juice and sugar, stir, then add the lavender cheesecloth bag. Boil for 2 minutes. Remove bag of lavender and discard. Strain hot jelly through cheesecloth into sterilized jars and seal (I use 2-piece jelly lids, kept hot in boiling water but some people prefer the old method of sealing with paraffin). 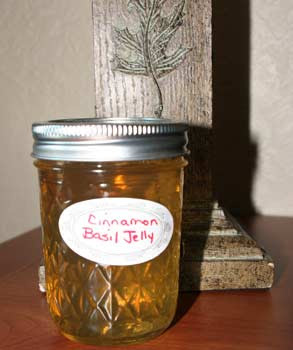 Cinnamon Basil makes an excellent jelly for all sorts of winter uses. In saucepan, make herb infusion with juice and herb by bringing juice to a boil and adding the verbena leaves. Boil for about 10 seconds, then let cool completely. Strain and discard leaves. You'll need 1 1/2 cups of herb infusion liquid. Combine the herb infusion with lemon juice (or vinegar), food coloring and pectin. Bring to a rolling boil. Mix in sugar and bring to a full rolling boil again. Boil hard for one minute. Add butter, stir. If any foam remains, skim off and discard. 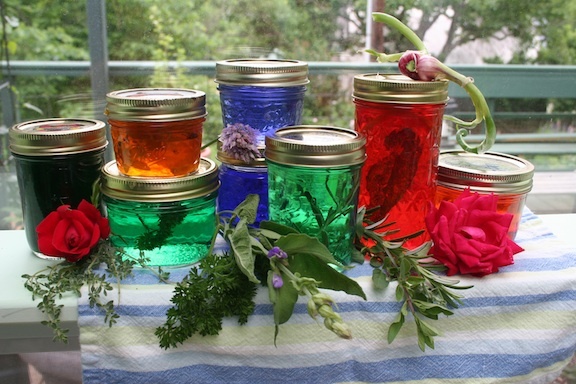 Pour into hot sterilized jars with optional leaf in each jar. Wipe jar edges with damp cloth, then screw on hot jar lids, tightening moderately but don't over-tighten. Turn jars upside down to seal, for about 30 seconds. Turn upright and let cool on dishtowel. Store in a dark, cool place. Every imaginable kind of squash, pumpkin and melon. 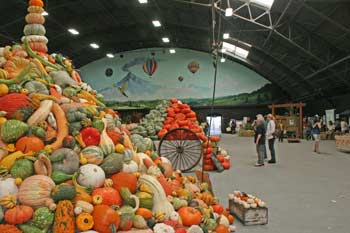 Mountains of squash and pumpkins in the demonstration hall. The last time I felt like I was in a large group of like-minded gardeners was at the Terra Madre Slow Foods Conference in Turin, Italy, back in 2005. 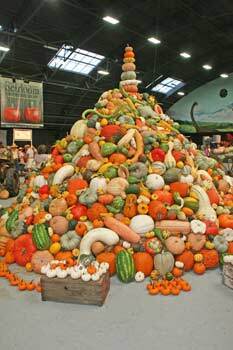 That is, until the National Heirloom Exposition this past week. 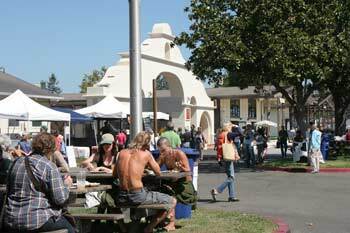 The event brought together seed companies, chefs, foodies, serious gardeners, old hippies, new hippies, WWOOFers and anyone interested in locally grown, organic and sustainable foods. Baker Creek Seed, in Mansfield, MO combined efforts with several local and national organizations to put this conference together. Whole Foods, Inc., Seed Savers, Southern Seed Exchange, several organic farming and organic certification organizations. What I kept hearing as people walked around was, "Everyone here gets it! We're all here for the same reasons!" 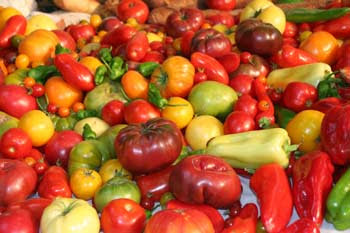 There was tomato tastings, rare fruit displays, contests, workshops and demonstrations. 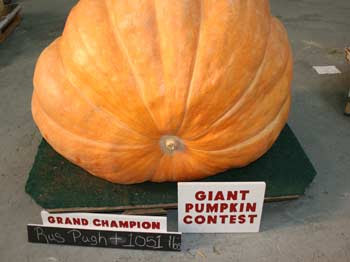 Giant pumpkins were on hand for judging. In fact, I can safely say that between the giant pumpkins, the enormous mountains of pumpkins and squash in the display hall, and the children's pumpkin mazes outdoors, there were literally tons and tons of pumpkins at the Expo! If you can't read it, it says 1051 pounds! Each of the 3 days had 3 tracts of speakers every hour from 11:30 a.m. to 7:30 p.m. I was nervous about being the first speaker on the very first day, 11:30 a.m. on Tuesday. I expected maybe 20 people to show up, considering people were still finding their way around. I'm honored to report, the room was filled, standing room only! The estimate was 250 people, and oddly enough, many were fans of mine from magazine writing, some even said they had all of my books! But, there were about 70 outstanding speakers in all, with enthusiastic audiences and great exchanges of information. 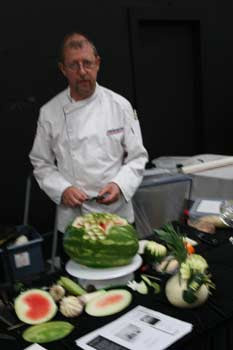 This chef was demonstrating the Thai art of vegetable and fruit carving. 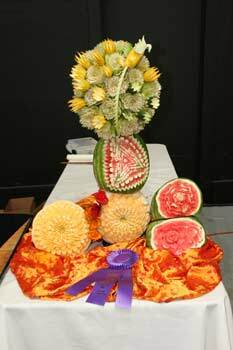 Click on this photo and look at the incredible carved melons. Besides buildings filled with heirloom vegetables and fruit, other buildings held rare heirloom breeds of sheep, chickens, cattle and goats. You may recall I'm a big fan of State Fairs. This Expo was bigger and better than our own Missouri State Fair (if you remove the Midway-carnival part). The produce displays and the demonstrations were both way better than any State Fair I have attended anywhere! 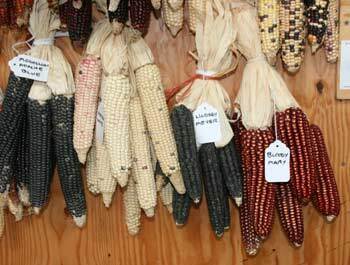 There were dozens of kinds of heirloom and rare varieties of corn. Enlarge the photo to see 'Bloody Butcher' the red corn on the right, to see how beautiful it is. This fellow made this bread and pizza oven the first day and it was ready to fire on the third day . There were ongoing demonstrations every hour. 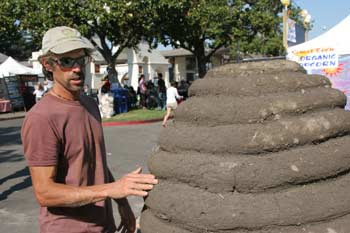 The fellow above made this oven the first day of the Expo, out of a mixture of ground corncobs, concrete and straw. He put the finish on it on the second day and by day three, it was ready for a fire inside to cook a pizza. 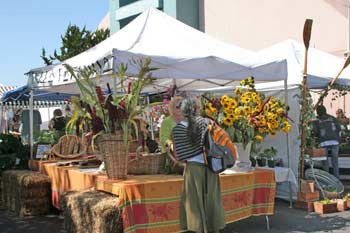 Demonstrations on soapmaking, weaving, seed saving, and many, many more happened on the hour. 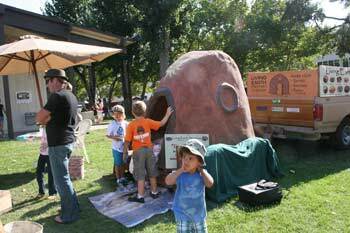 There were lots of activities for kids and the oven guy helped kids of all ages mix the concrete mix and make tiny ovens. 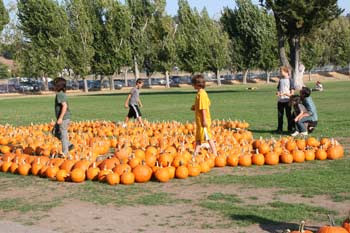 There were 3 pumpkin mazes for kids, and lots of activities for kids. There was bluegrass and local music going on all day, outside and inside, too. A wide variety of food vendors served really good foods. Mushroom-stuffed crepes, pulled pork, grilled local beef burgers, veggie sandwiches, grilled heirloom tomatoes with local cheese, organic ice cream, the list is much longer but that's all I can remember. Fair goers ate well! Produce vendors sold local vegetables and fruits, too. The setting for the Expo was beautiful and surrounded by trees and picnic tables for relaxing and eating meals. 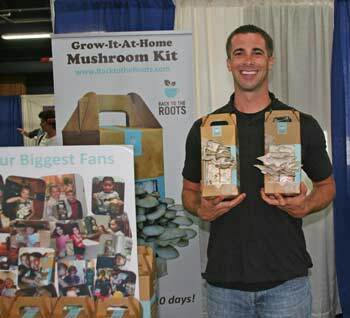 These mushroom kits grow on used coffee grounds! Inside the vendor building where we were, there was a wide variety of really interesting products. The folks, above, sell a mushroom kit that's so simple to use, we had to have one. The box is filled with ground coffee grounds and mushroom spawn. You simply mist one side of the box with water and the mushrooms grow out the side of the box. When you're done harvesting, begin misting the other side of the box for a second crop of mushrooms! I was fascinated by the Hudson Valley Seed Co. packets. 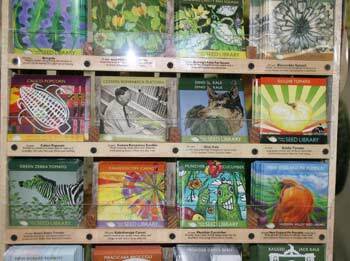 Every year they hold an art contest and the winners have their artwork on the seed packet that year. They're collectible and inexpensive. What a good idea! 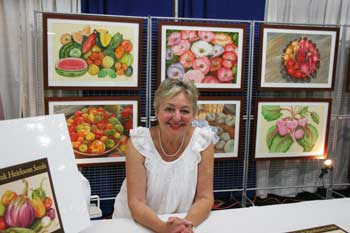 This is the artist who created the paintings for the Heirloom Gardener 2012 calendar. 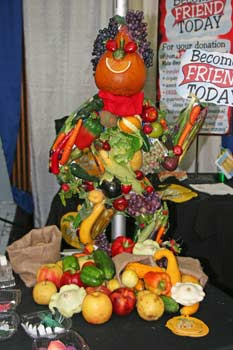 I liked this vegetable lady, all assembled out of colorful veggies. It was a successful and interesting trip to Santa Rosa. I'm hoping the group that organized this will do it again next year. I'm just guessing, but I think there must have been about 24,000 people spread over the 3 days. Sure, standing on concrete at our booth with Herbal Nail Soak and my books for 12 hours a day, then driving an hour to get to bed, left me worn to a frazzle. But it was an exceptional event that brought together a lot of people who are interested in the enormous whole foods, organic and local foods movement. There were displays, speakers and vendors from all across the United States, this definitely was not a local event! And it also brought together lots of our Garden Writing Assoc. friends (Felder Rushing, Brent Heath, Kelly Norris and several more). This was my last speaking gig for the year, and a good way to end the speaking tours. I've been on the road between 1 and 3 weeks out of every month for out of state speaking since March and I'm ready to get to be home for awhile. Someone recently asked me what it is that I do when I'm not gardening, writing or traveling for lectures. I answered I visit other people's gardens and enjoy the food from them. Out of all my trips this year so far, this is the first one where I've had free time that didn't involve speaking or selling. What did I do? Visit more gardens, of course! Here's a sampling of time in and around San Francisco, with more details coming later. The sign for the restaurant is so understated and hidden in the bushes, it's hard to see. I've always wanted to visit the world famous French Laundry restaurant and today accomplished that. 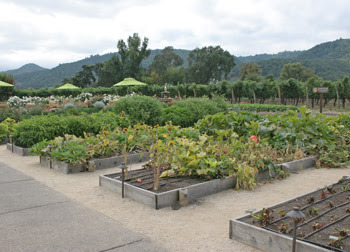 Restaurants like this one, as well as Chez Panise (owned by Alice Waters, one of the speakers at the National Heirloom Expo in Santa Rosa where I'm also speaking this week) and the very famous Herbfarm Restaurant outside Seattle, have been early pioneers in the trend for restaurants having their own gardens. I've written several times about The Herbfarm Restaurant, owned by our friends Ron Zimmerman and Carry Van Dyck and their remarkable herb gardens and food. Here's a taste of the gardens at the French Laundry. Tucker's a talented and creative horticulturist. 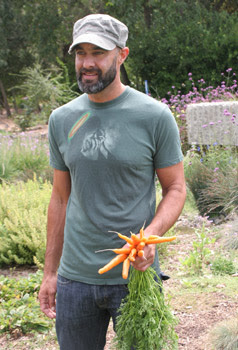 Meet the head horticulturist, Tucker Taylor, who is responsible for this bountiful garden. Tucker told us the gardens furnish all of the produce for not only the French Laundry but the 2 other restaurants they own in Yountsville, CA. 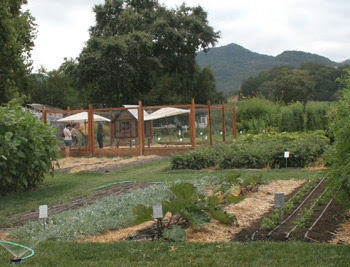 While the garden isn't certified organic, they use organic methods for the lowest impact on the location. I was pleased to see the French Laundry has chickens, although our little flock of 60 birds back home don't have fancy digs like these. 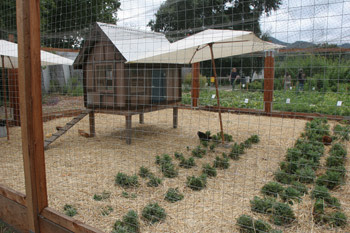 The chickens have their own garden, umbrella, yard and house. Pretty cool. 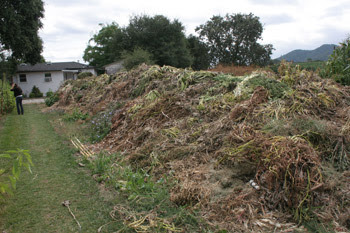 But it's the gardens that are impressive, so here are a few pics of those and of their massive compost pile. I was glad to see how well they make and use their compost from the leftovers from the garden. Tucker and his crew grow a wide variety of vegetables, herbs and flowers specifically for the restaurant. 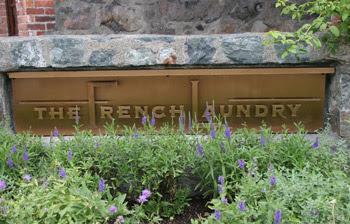 One tiny corner of the garden, with the French Laundry restaurant across the street. This year's compost pile, which will become next year's soil. Another restaurant garden was at Oakville Vineyard, where we had brunch. 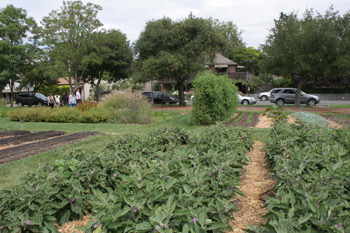 Their extensive gardens provide the food for their restaurant chefs and for the many visitors who come on tours and meals. Oakville's gardens are for both production and for easy access by the chefs and staff on a daily basis. 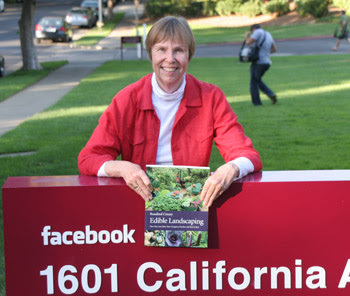 We spent the evening with our author and friend, Rosalind Creasy who took us to Palo Alto where we visited Stanford University, and the Facebook headquarters. I asked Ros to pose with her best-selling book, Edible Landscaping. We had a wonderful evening in her garden and enjoyed dinner from her backyard, as well. Palo Alto is the home of Facebook. They, too, have a very understated, modest sign. If you haven't read her book, you should. She is also one of the early pioneers in the current whole foods, healthy eating movement. More about her gardens later and more gardens and stories from California. Happy gardening! That's Josh at our table, passing out media packets for How to Eat a Rose. I always come away from a Garden Writers Association conference with new ideas, new friends and renewed connections. It is the best professional organization I belong to, and the best community of sharing authors and plant people. 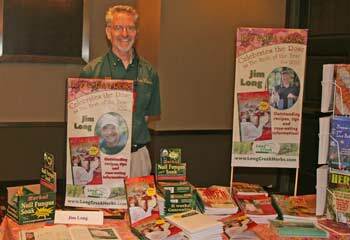 I was there, promoting my How to Eat a Rose book in conjunction with next year's Herb of the Year project as designated by the International Herb Association. 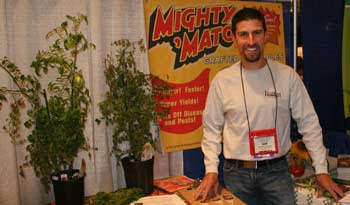 Josh Kirchenbaum, in the Territorial Seed booth, showing off their line of Mighty 'Maters, tomatoes with two varieties grafted onto disease-hardy rootstock. You may remember my earlier posts about these tomatoes I'm trialing this year. It's a big conference, about 500 people and an impressive trade show. 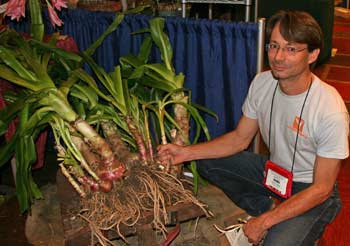 Plant people introduce their new plants for next year, book authors showcase their books, publishers seek out new authors and the garden tool companies offer new garden things to take home. All in all, we writer-types are treated extremely well, with all the companies wanting us to write about their products and plants (which I will be doing in the coming months). I can only hit some of the highlights here, I'm still processing and digesting all I saw and learned. 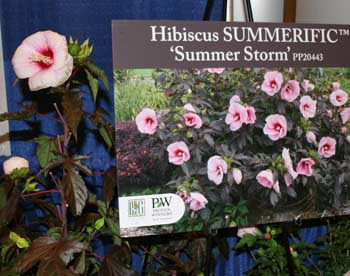 I like hibiscus of all kinds and this one is exceptional, from Proven Winners. It's called 'Summer Storm' with pink flowers and deep maroon leaves. You'll see it in garden centers and nurseries next spring. 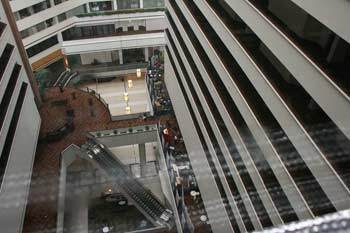 You many not be able to tell from the photo, below, that's a 20 story atrium in the hotel we were in. The glass-sided elevators gave excellent views of each landing. Looking down from the elevator, you can see our Garden Writers trade show floor. 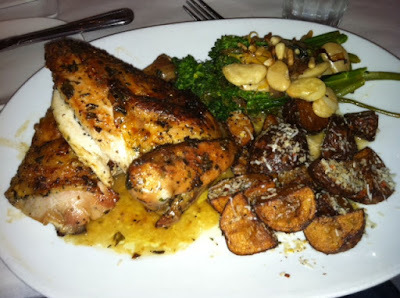 That's chicken, cooked under a brick. Yes, really. It flattens the chicken, makes it crisp. 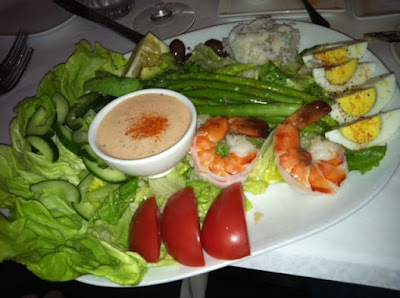 Shrimp Louie; even the deviled eggs were made with truffles. Herbs everywhere! 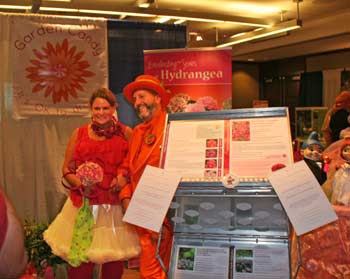 Angela Treadwell-Palmer & Jim Martin, always dress up the show with their plant introductions and their costumes. Angela is the PR person for Plants Neuveau, a company that has introduced some incredible plants in this and previous years. 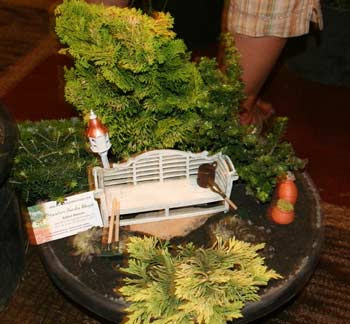 Miniature and Fairy Gardens are popular this year. Tools, benches and more from Kathryn Newman of www.miniaturegardenshoppe.com. She even sells tiny fences, stepping stones and more for the Fairy Garden. 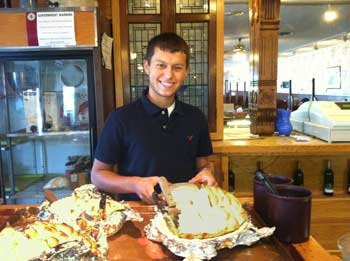 Pie Boy at the Blue Sky Cafe, Exit 30 on Illinois I-70. And like any good trip, we finished it off with pie. The Blue Sky Cafe has been making real pie for half a century. 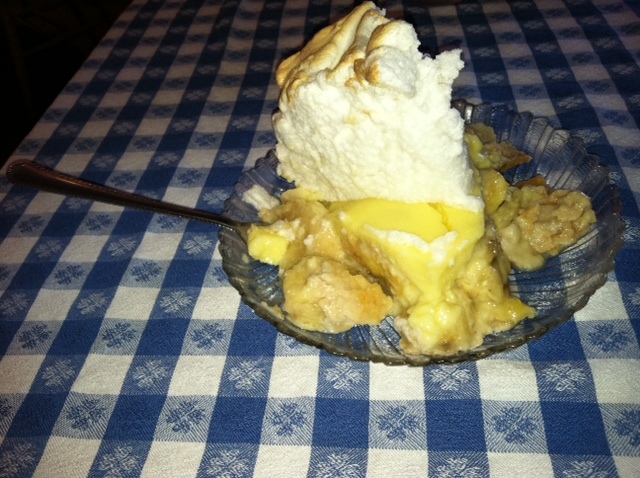 I had banana, which is probably the best banana pie I've had in 30 years. Don't you wish you had a piece right now? 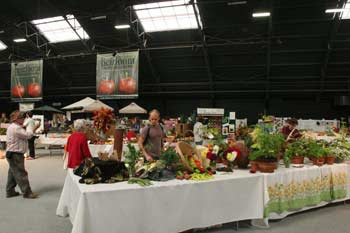 Come see us at our booth at the National Heirloom Exposition in Santa Rosa, California, Sept. 13-15. I'll be speaking, along with Felder Rushing, Alice Waters and a whole lot of other garden folks. Stop by and say hi!